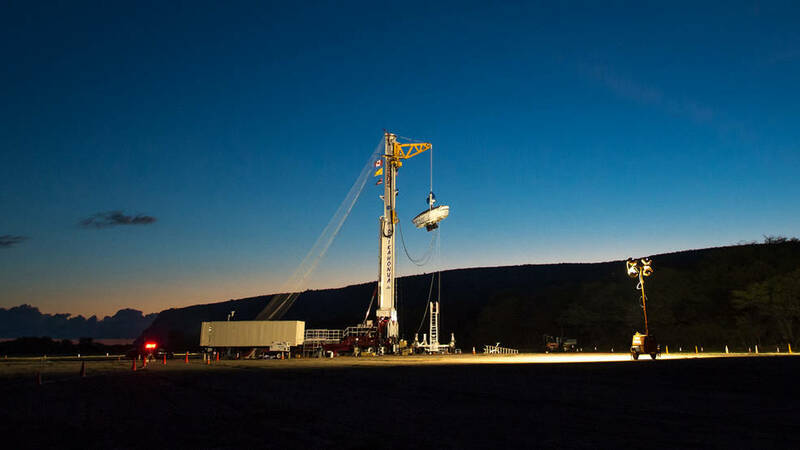 June 9, 2015 – Engineers are poring over the data following the second experimental landing technology test of NASA’s Low-Density Supersonic Decelerator (LDSD) project. The saucer-shaped LDSD craft splashed down at 11:49 a.m. HST (5:49 p.m. EDT) Monday in the Pacific Ocean off the west coast of the Hawaiian island of Kauai. During this flight, the project team tested two decelerator technologies that could enable larger payloads to land safely on the surface of Mars, and allow access to more of the planet’s surface by assisting landings at higher-altitude sites. A high-altitude balloon carrying the LDSD test vehicle launched at 7:45 a.m. from the U.S. Navy’s Pacific Missile Range Facility (PMRF) on Kauai. As planned, at 11:35 a.m., the vehicle separated from the balloon at about 120,000 feet above the ocean. An onboard rocket motor then took the vehicle to 180,000 feet, where the first braking technology, the Supersonic Inflatable Aerodynamic Decelerator (SIAD), deployed at about Mach 3 at 11:37 a.m.
Fourteen seconds after SIAD inflation, the test vehicle’s parachute was released into the supersonic slipstream, according to plan. Preliminary analysis of imagery and other data received during the test indicates the Supersonic Ringsail parachute deployed. This 100-foot-wide parachute is the largest supersonic parachute ever flown. It has more than double the area of the parachute used for the Mars Science Laboratory mission that carried the Curiosity rover to the surface of Mars. The chute began to generate large amounts of drag and a tear appeared in the canopy at about the time it was fully inflated. Monday’s flight test was the second for the project. During the first flight on June 28, 2014, the main goal was to demonstrate and operate the vehicle through its entire mission. That flight also carried the two LDSD braking technologies, and the SIAD worked perfectly during the first test. However, the supersonic parachute did not inflate as designed. With the data from last year’s test, the LDSD team developed a new formula for this year’s chute, making it stronger and more curved into its top to help it survive the initial shock of supersonic wind. “The physics involved with LDSD is so cutting-edge we learn something profound every time we test,” said Ian Clark, principal investigator for LDSD at JPL. “Going into this year’s flight, I wanted to see that the parachute opened further than it did last year before it began to rupture. The limited data set we have at present indicates we may not only have gone well down the road to full inflation, but we may have achieved it. NASA expects to make high-resolution imagery and comprehensive data from the test available to the public in about two weeks. NASA’s Space Technology Mission Directorate funds the LDSD mission, a cooperative effort led by JPL. The Technology Demonstration Mission Program at NASA’s Marshall Space Flight Center in Huntsville, Alabama, manages LDSD. NASA’s Wallops Flight Facility, on Wallops Island, Virginia, coordinates range and safety support with PMRF and provides the balloon systems for the LDSD test.